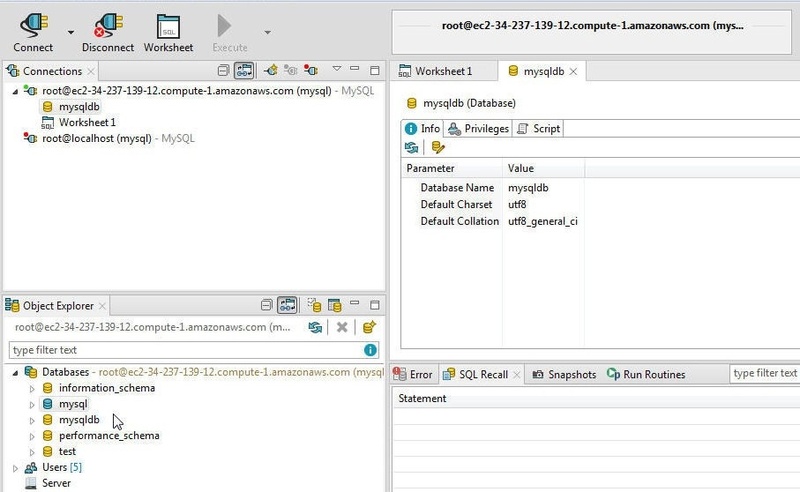 In the first of two articles on using Toad Edge 1.1 with MySQL database that is running on AWS EC2 we discussed creating an EC2 instance using a MySQL AMI. 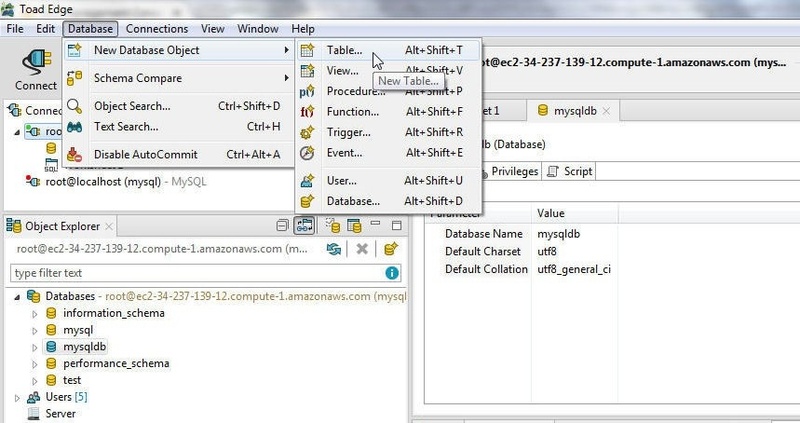 Subsequently we obtained the password for the MySQL root user and connected to the database with a MySQL CLI. 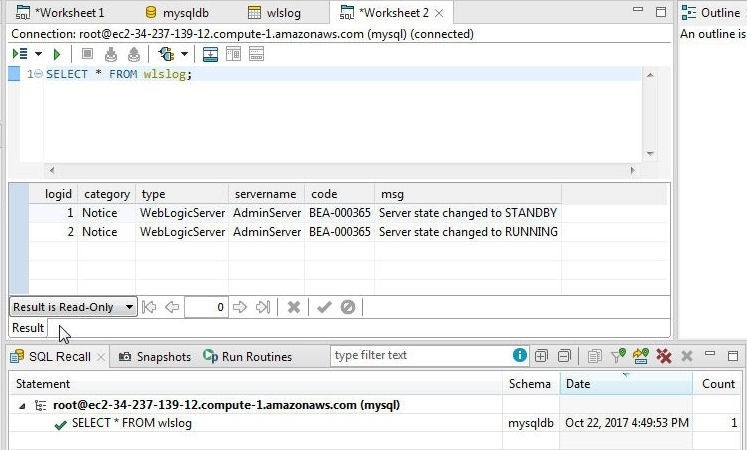 In this article we shall connect to the MySQL database running on an AWS EC2 instance using Toad Edge 1.1. This article has the following sections. 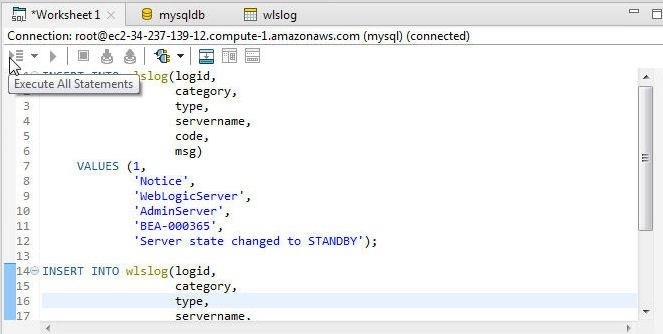 In this section we shall connect to MySQL on EC2 with Toad Edge. 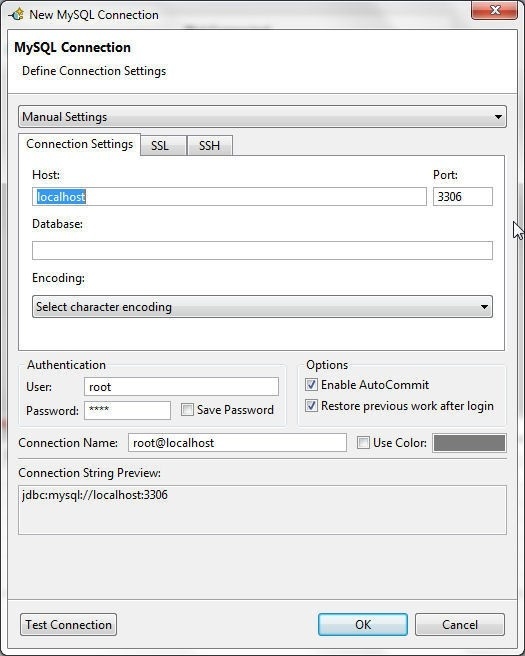 Select Connect>New Connection as shown in Figure 1. 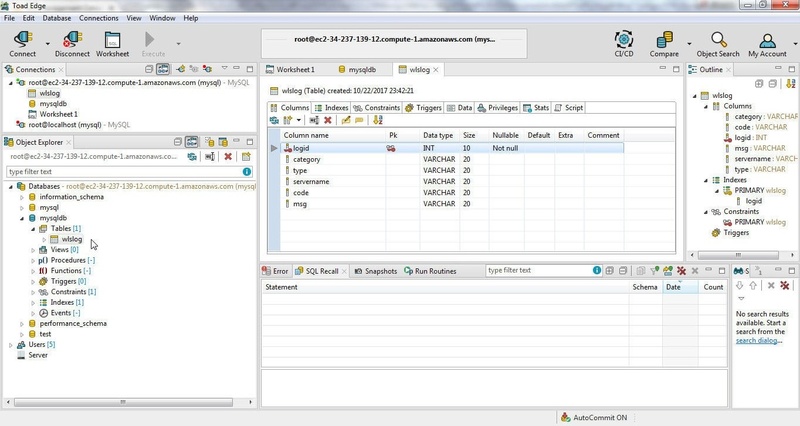 The New MySQL Connection wizard gets started, as shown in Figure 2. The default for Host is localhost, which needs to be modified to the Public DNS of the EC2 instance. Obtain the Public DNS from the EC2 console as shown in Figure 3. Specify the Public DNS in the Host field as shown in Figure 4. Specify Database as mysql. 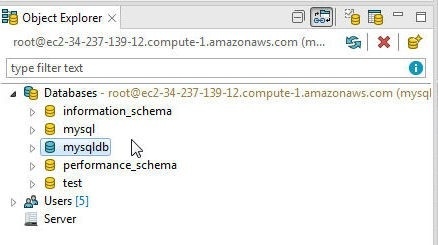 In Authentication specify user as root and specify Password as the password listed in the system log for the EC2 instance (Figure 14 of the first article in this series). Click on Test Connection to test the connection. If a connection gets established the message Connection is OK gets displayed, as shown in Figure 5. Click on OK to create the connection in Toad Edge. A new connection gets added to Toad Edge Connections view, as shown in Figure 6. 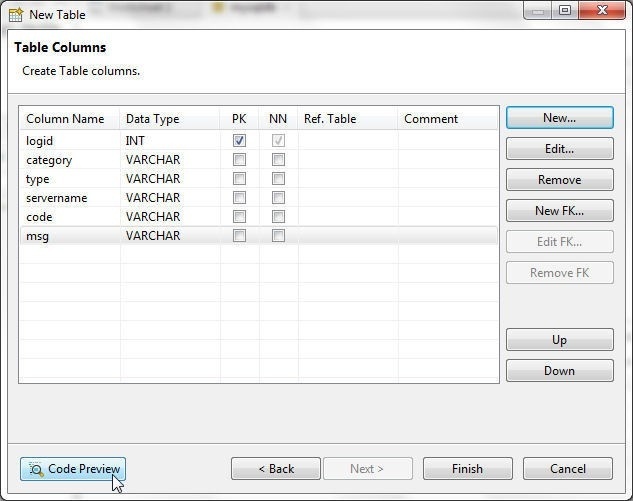 To create a new database click on Create a New Database as shown in Figure 7. 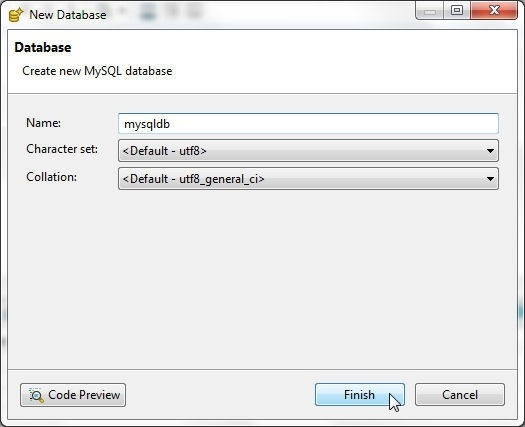 In New Database wizard specify a database name (mysqldb) and click on Finish as shown in Figure 8. 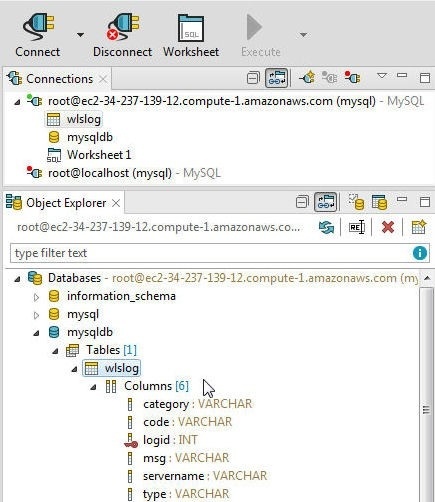 A new database (mysqldb) gets added in Object Explorer in Databases as shown in Figure 9. 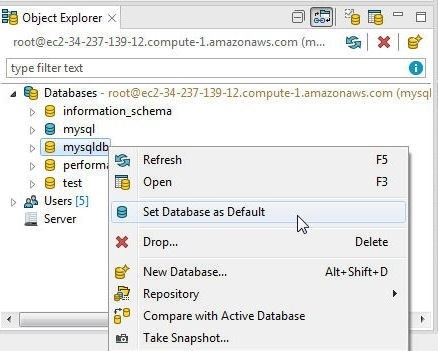 To use the database set the database as the default database. 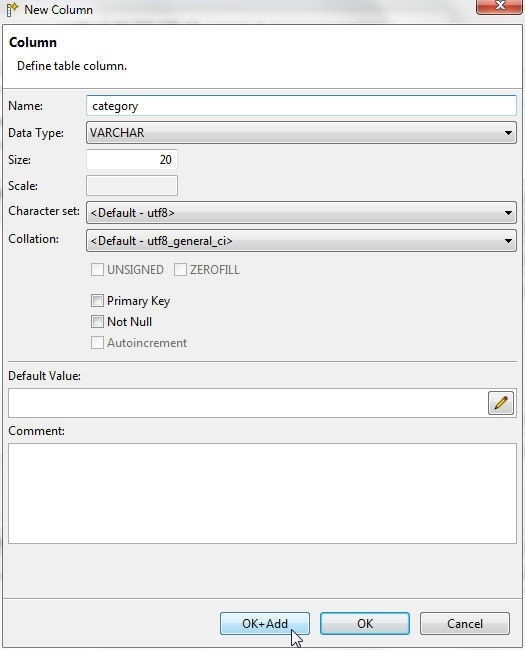 Right-click on the database and select Set Database as Default as shown in Figure 10. The mysqldb database gets set as the default database as indicated by the blue(ish) color in Figure 11. List the databases with the following command. The output from the preceding command is shown in Figure 12. 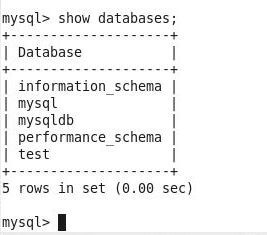 To use the database in the MySQL CLI the following command sets the database as the current database. The database gets set as the current database, as shown in Figure 13. 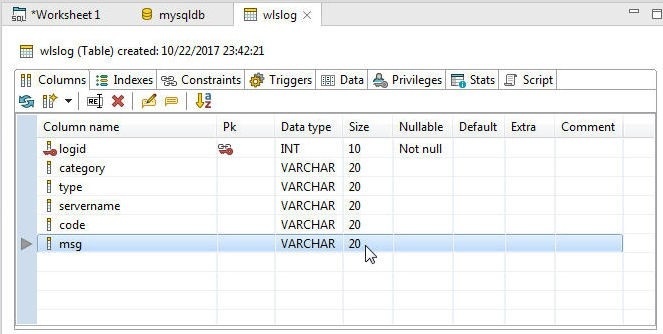 In the section we shall create a new database table using the New Table wizard. 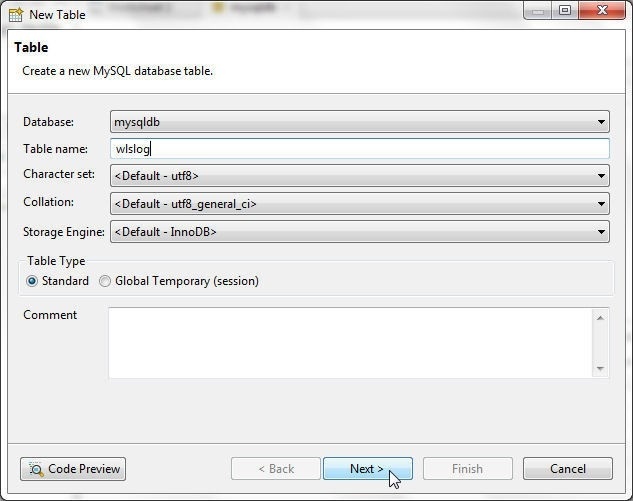 With the mysqldb as the default database select Database>New Database Object>Table as shown in Figure 14. 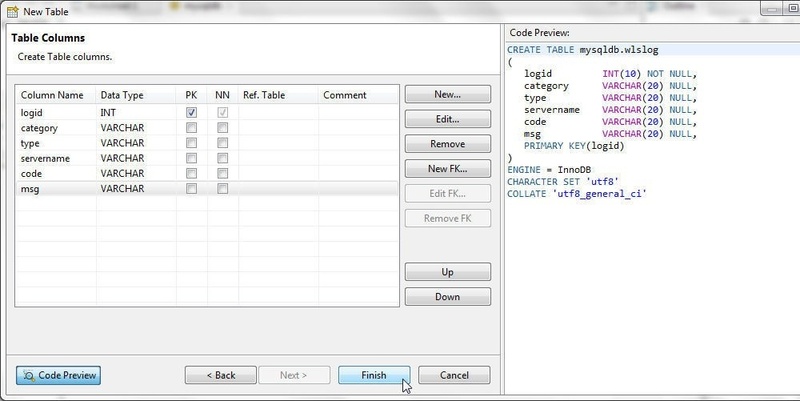 In the New Table wizard the database is selected as mysqldb, as shown in Figure 15. Specify a Table name such as wlslog. Click on Next. 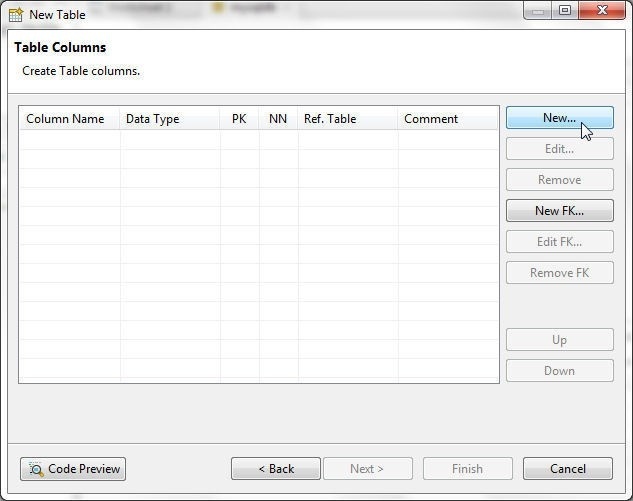 In Table Columns click on New to add table columns as shown in Figure 16. In New Column wizard specify a column name (logid as an example) as shown in Figure 17. Select Data Type for the column as INT as shown in Figure 18. 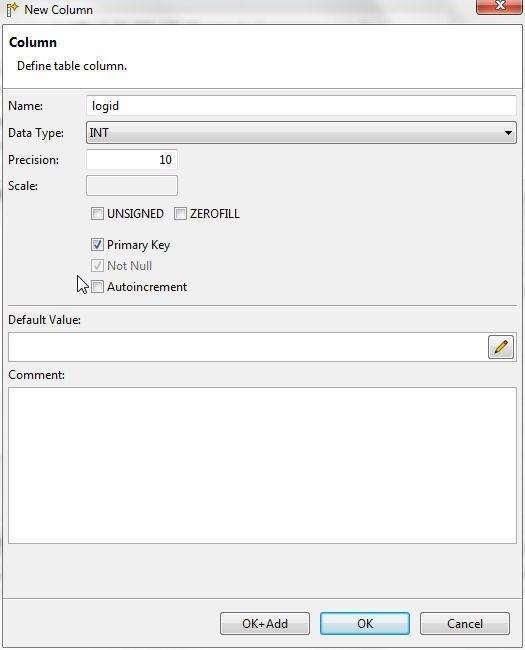 Specify a Precision (10) and select the Primary Key checkbox as shown in Figure 19. The Not Null checkbox gets selected when the Primary Key checkbox is selected. Click on OK+Add as shown in Figure 20. A column gets added and a new New Column wizard gets opened, as shown in Figure 21. Add another column (category for example) and click on OK+Add as shown in Figure 22. After all columns (logid, category, type, servername, code and msg) have been added click on Code Preview as shown in Figure 23. The Code Preview gets displayed, as shown in Figure 24. Click on Finish to create the database table. 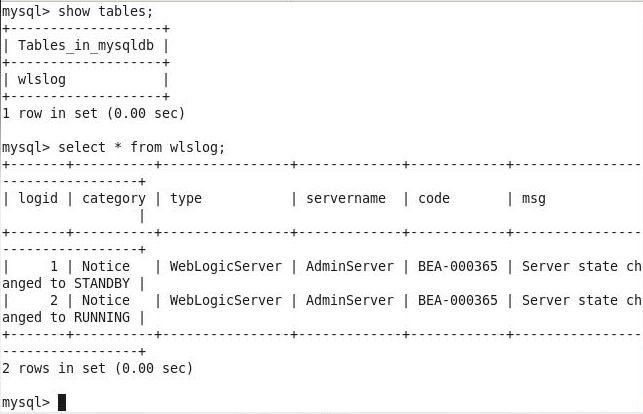 The database table wlslog gets created, as shown by the Object Explorer>Databases>mysqldb>Tables>wlslog in Figure 25. AutoCommit is ON by default, as indicated by a message in lower bar in Figure 25. Click on the wlslog table to display the table columns as shown in Figure 26. Table or table columns may be modified after being created. For example, the column size for the msg column is 20, as shown in Figure 27. 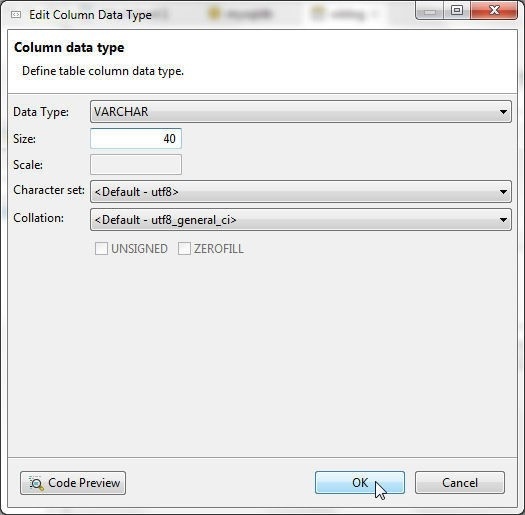 To edit data type right-click on the column and select Edit Data Type as shown in Figure 28. 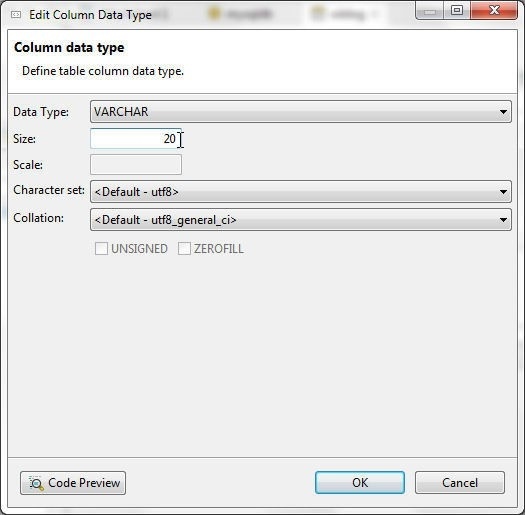 Other options include Add Column, Drop Column, Rename Column, Edit Column Comment, Edit Default Value, Set 'Not null' constraint, Add Constraint, and Sort Columns Alphabetically. As an example, modify the column size for the msg column, which is set to 20 as shown in Figure 29. Double-click on the msg column size setting. The Edit Column Data Type wizard gets started, as shown in Figure 30. Modify the Size to 40 and click on OK as shown in Figure 31. The column size for the msg column gets set to 40, as shown in Figure 32. 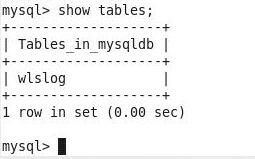 The table added may be listed in the MySQL CLI with the following command. The wlslog table gets listed, as shown in Figure 33. In this section we shall add table data to the wlslog table using the Worksheet shown in Figure 34. One worksheet gets created by default for each new connection in Toad Edge. 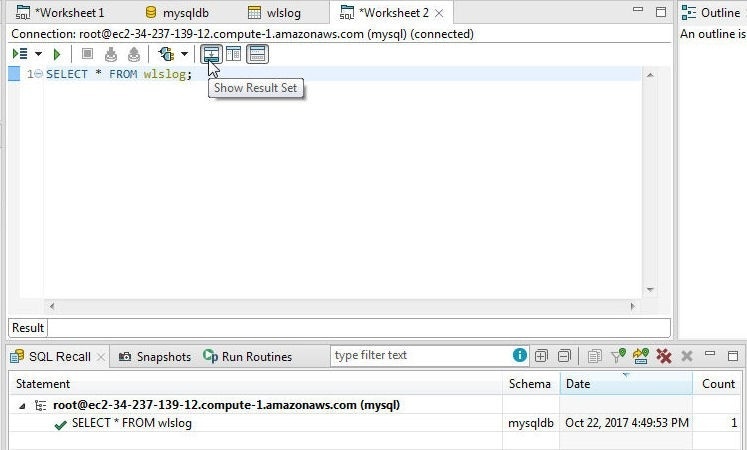 Copy the following SQL script to add data to the Worksheet1. 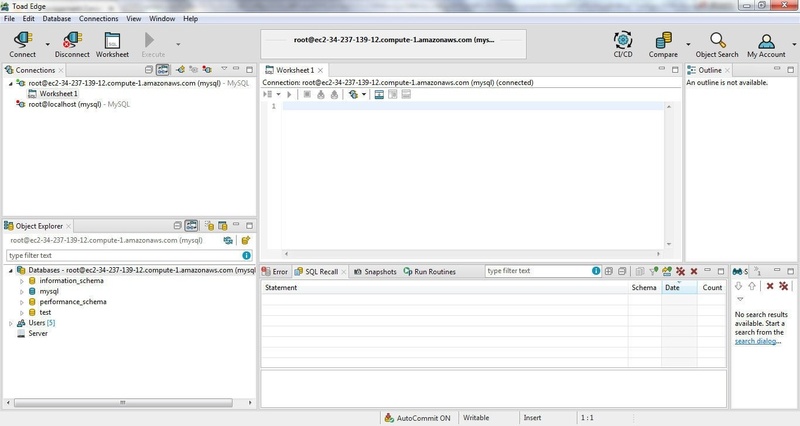 Click on Execute All Statements to run the SQL Script, as shown in Figure 35. The two SQL statements get processed, as shown in SQL Recall in Figure 36. Run the following SQL statement in MySQL CLI to list the data added. The data added gets listed, as shown in Figure 37. Next, we shall run a SQL query on the table created. 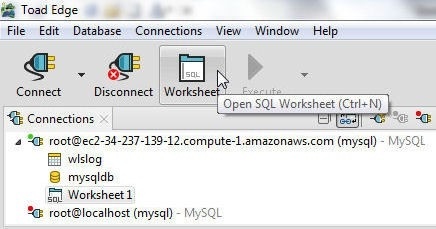 Click on Open SQL Worksheet as shown in Figure 38. 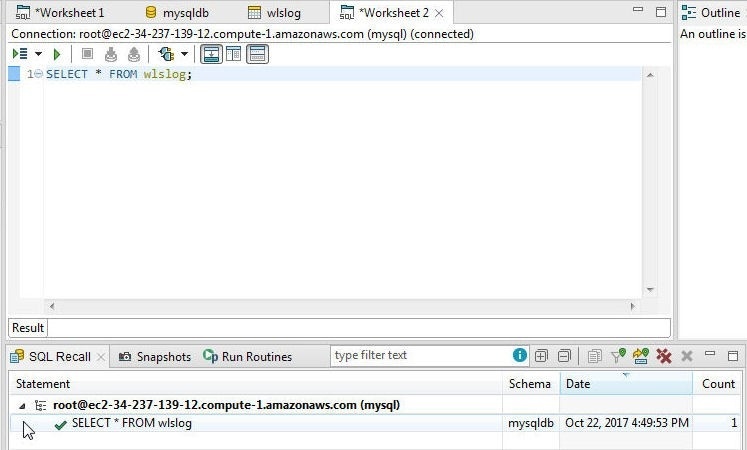 Add a SQL statement to the Worksheet2 to query the wlslog table as shown in Figure 39. 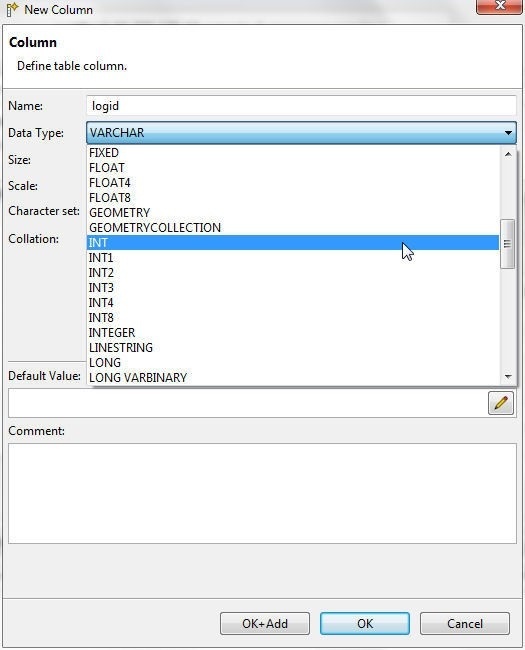 The SELECT * FROM wlslog statement selects all columns. 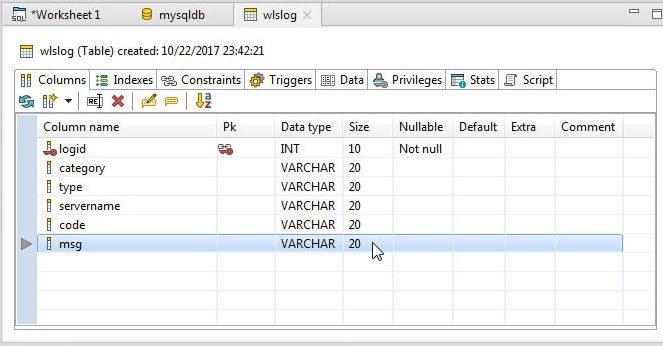 Click on Execute SQL Statement as shown in Figure 40 to run the query. As SQL Recall in Figure 41 indicates, the SELECT statement gets run. To display the result set click on Show Result Set as shown in Figure 42. The Result Set gets displayed, as shown in Figure 43. 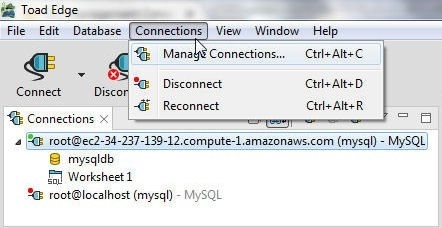 To disconnect the connection to the MySQL database on EC2 right-click on the connection and select Disconnect as shown in Figure 44. Disconnect may also be selected from the Connections in the tool bar as shown in Figure 45. The connection gets disconnected, as shown in Figure 46. The icon for a disconnected connection has a red indicator and an icon for a connected connection has a green indicator. 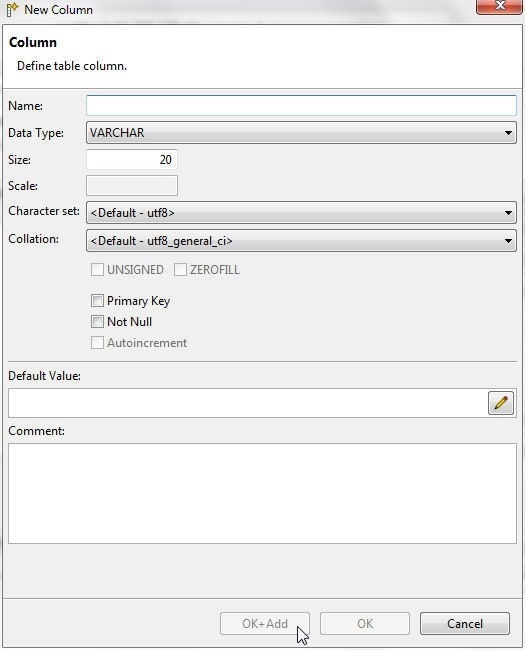 To remove the connection right-click on the connection in Connections and select Remove Connection as shown in Figure 47. In the Confirm dialog click on OK as shown in Figure 48. The EC2 instance may be stopped when not required to be used. To stop the EC2 instance select the EC2 instance in the EC2 Console and select Actions>Instance State>Stop as shown in Figure 49. The other options are to Reboot and Terminate the EC2 instance. 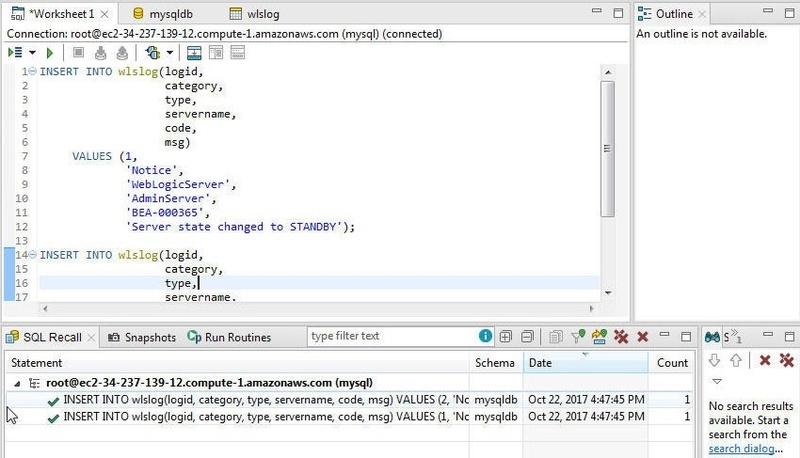 In two articles we have discussed using a MySQL database instance running on an AWS EC2 instance. 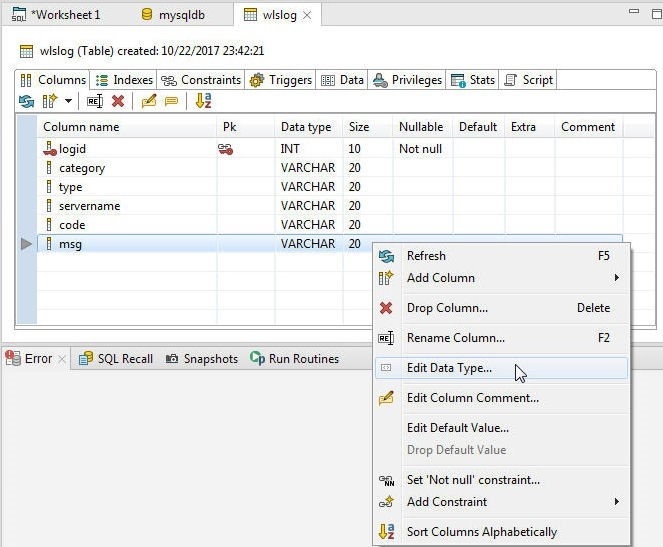 Toad Edge 1.1 is an integrated development environment (IDE) for using MySQL database with built-in wizards for connecting to a database, creating a new database, creating a database table, adding table data, and querying a table.